Q: I found an animal that needs help, what do I do now? Do not handle the animal. 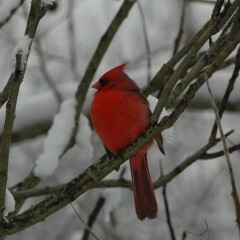 Call the Wildlife Center at 330.477.0448 for instructions or follow the voicemail instructions. Q: How can I get rid of an animal in my attic/under my porch or shed? Put a radio in the attic or pointed under your porch/shed. Leave it on a hard rock station (just loud enough to have a constant sound) for three days and three nights. On the fourth day if the animal is gone, close up any holes to deter more unwanted visitors. Q: What do I do if my cat/dog caught an animal? Cat saliva is full of bacteria and can be very harmful to wildlife. Dogs can cause unseen internal injuries if they catch an animal in their mouth. Call the center to bring the animal in to get examined. Q: I found a bat in my house, what do I do? If the bat was found in a bedroom overnight with a sleeping child or adult, please call your local health department. Otherwise, close off the room that the bat was found in and open a non-screened window at least two inches. It will find its way out after dark. If this is not an option, wait until the bat is motionless to a place box, coffee can, or similar object over the bat. Take a piece of cardboard and slide it between the object and the surface the bat is on containing the bat. Take it outside and lift the container while holding it about five feet off the ground to allow the bat to fly away. Do not release a bat during the day or during cold/bad weather. Q: Can I keep a wild animal as a pet? No. Wild animals are protected by federal and state laws, making it illegal for anyone to possess them without the proper permits. Q: Can you help with nuisance animals and trapping? We can offer a variety of tips to help deter nuisance animals. Remember that if wildlife do not have suitable shelter or a food sources, they will probably not inhabit an area. Give us a call for safe solutions! Q: Can I release an animal at Stark Parks? No. Animals cannot be released on park property. The skin on amphibians is different than any other species, so care must be taken when transporting them. They must be kept moist and cool, so a small plastic container with a moist paper towel inside will be best. Limit contact as much as possible to avoid transferring soaps, chemicals, or lotions to the skin of these animals. Amphibians are on their own from the time they are born, and will never truly be orphaned. 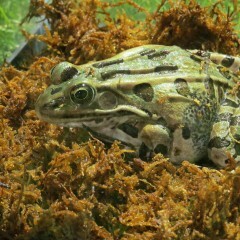 The only time an amphibian will need to be brought into a rehabilitation center is if it has visible wounds or if it is found out in the winter months. Amphibians generally are not a large nuisance problem. However, a large insect population will attract amphibians. Controlling the insect population is the best way to deter amphibians from an area. Bats are nocturnal, so any bat that is down during the day will need help. Most encounters will be with adults unless it is late May through July when babies are born. Injuries are usually due to predator attacks such as hawks, owls, and cats. Although they are considered rabies vectors, rabid bats usually live only a short time after becoming infected. If you discover a bat inside a room where a person has been asleep, capture it and take it to the local health department for testing. It is not able to fly. Note: Bats are not able to fly off of a horizontal surface. They must be vertical. Baby bats can be re-nested if you are able to find their roosting site. Place the bat as close to the roost as possible. Check back at night fall to make sure the bat re-joined the colony. You find a baby bat and are not able to find the roost. You attempt to re-nest the bat and upon checking on it after night fall, it is alone in the same location you left it. 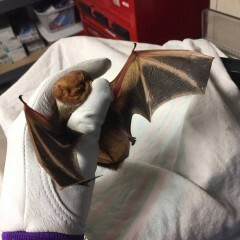 If you choose to capture a bat for treatment, protect yourself from bites by using thick gloves and avoid direct contact. Wait until the bat is motionless, then place a Tupperware container over it and slide a piece of paper between the container and the object it is perching on. Once in the container, put on a lid with small holes for air. If you are transporting a baby, add supplemental heat via a warm water bottle or hands warmers covered by a thin towel or paper towel. Be sure to secure the water bottle so it does not roll over the baby during transport. NEVER attempt to give an animal food- inappropriate food or feedings can severely damage or kill wildlife. Leave a window open for it to leave during the night. It will find it! Using thick gloves and avoiding direct contact, contain it by placing a Tupperware container over it and sliding a piece of paper/cardboard between the container and the object it is perching on. Once in the container, put on a lid with small holes for air. Take outdoors and place container on a vertical surface such as a tree and let the bat attach. If you find a bat in a room where someone was sleeping, the bat will need to be taken to your local health department for testing. Set a radio near the colony and play it constantly on a hard rock station for three days and three nights. It must be loud enough to be heard throughout the area. 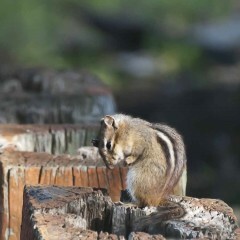 Young chipmunks do not appear above ground until they are fairly independent and a minimum of six weeks old. Keep the animal in a warm, quiet, dark location where it will be protected until you can bring it to a rehabilitation center. Young animals should be given a heat source, especially if kept overnight. NEVER attempt to give an animal food - inappropriate food or feedings can severely damage or kill wildlife. Use scare tactics to persuade them to leave on their own. These include loud noises such as obnoxious music, predator urine (can be purchased at hunting retailers), and rodent deterrents such as Critter Ridder. Live traps can be used to catch chipmunks as long as laws for trapping and relocating are followed. Do not touch a fox! Observe only. 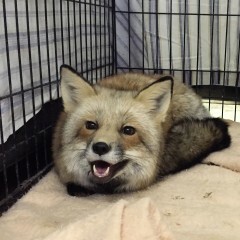 Foxes are a species of concern as a rabies carrier and can be aggressive. Injuries (which may peak in December through February due to breeding season) are usually caused by car hits, poisoning, snare traps, or self-inflicted wounds due to mange. Cubs may surface form April to May while they practice their developing skills outside their dens. Parents will leave cubs alone several times to hunt for food. Cubs should only be taken into captivity as a last resort! It is out during daylight hours but is not showing any signs of being ill. It may be a mother out hunting for some extra food, observe her behavior- if it appears normal leave her alone. If you choose to capture one for treatment, protect yourself from bites by using thick gloves and avoid direct contact. Wait until the fox is motionless, and then gently toss a large box over it. Slide a piece of board under the box, containing it. Once contained, you can gently tip the box up-right and secure the board with duct tape. Other options include luring the fox into a dog carrier using canned cat or dog food and closing the door once the fox enters or setting a live trap. Keep the animal in a warm, quiet, dark location where it will be protected until you can bring it to a rehabilitation center. Young animals should be given a heat source, especially if kept overnight. NEVER attempt to give an animal food- inappropriate food or feedings can severely damage or kill wildlife. Set a radio near where the fox is entering (without blocking it) and play it constantly on a hard rock station for three days and three nights. It must be loud enough to be heard throughout the area. Human adult male urine! Yup, that’s right! Have an adult male urinate around the area(s) you don’t want the fox! On the fourth day or when you know the fox to be gone, however it got in in the first place must be addressed to prevent it from happening again. A baby bird with white or gray downy feathers is out of the nest prematurely and needs your help. Try to locate the nest and return the bird if possible. Please keep cats indoors and dogs on a leash if you notice a fledgling in your yard. These young birds will be able to fly within a week or two. All native birds are protected by the migratory bird treaty act of 1918. You may not disturb the nest, eggs or young of any native species. If you have any questions or concerns regarding native migratory birds please give us a call or visit https://www.fws.gov/birds/policies-and-regulations/laws-legislations/migratory-bird-treaty-act.php. The opossum has its mouth open wide, is showing all of its teeth, and is drooling excessively- this is simply a defense mechanism and does not mean the animal is rabid. If it otherwise appears to be healthy, leave it alone. If you choose to capture one for treatment, remember to protect yourself from the opossum’s sharp teeth and claws. Keep the animal in a warm, quiet, dark location where it will be protected until you can bring it to a rehabilitation center. Young animals should be given a heat source, especially if kept overnight. 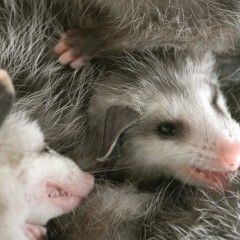 Baby opossums should have a source of both heat and humidity- place a warm, wet sponge or cloth in the box as well. NEVER attempt to give an animal food - inappropriate food or feedings can severely damage or kill wildlife. Opossums usually only come around when there is a readily available food source. Place vinegar or ammonia-soaked rags or fox urine (available in hunting supply stores) in the area. These may have to be refreshed several times a day. Opossums are nocturnal- wait until he is out for the night (anytime between midnight and dawn) and seal the entrance. Secure outbuildings with heavy-duty hardware cloth or poultry wire. For woodpiles place a vinegar or ammonia-soaked rag near the entrance. Small amounts of stress can easily kill confined wild rabbits, so handle them as little as possible. Chances are that you will never see a mother rabbit- this does not mean the nest is abandoned! Mothers only visit their nests at the end of the day and early morning and stay with the kits for less than 5 minutes, so don’t assume that a litter is orphaned unless you see the mother dead. The rabbit is large enough to be on its own and is uninjured but appears to be “frozen” in one spot. This rabbit most likely trying to go unnoticed, if you can approach the rabbit, place it in an area close to where is it found with some cover such as high weeds and check on it a half hour later- it will most likely be gone. The nest has been destroyed but the kits appear healthy and uninjured. Place them in their exact nesting spot and recreate the nest with grass or any remaining nesting materials. You are positive the nest has been abandoned for over 24 hours and the babies are unfurred, have their eyes closed, and are smaller than a tennis ball. To check if the nest is truly abandoned, place some small twigs or string across the nest in an intricate pattern (not two twigs in an X) and check for displacement in the morning. If it has been disrupted it means the mother is still around- leave it alone. Have been injured by lawn equipment. If the nest has been destroyed but the kits appear uninjured leave them in their exact nesting spot and recreate the nest with the remaining nesting materials. If your pet discovers a nest, leave unharmed babies in the nest and protect it from future intrusions by temporarily covering it with an upside-down laundry basket during the day and removing it at night, so the mother can visit. A mother rabbit should never be deterred from visiting her nest. 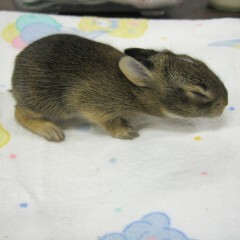 If you have a nest in your yard try to be patient, baby cottontails are on their own at only three to four weeks old. After they have left the nest use the following methods to prevent her from nesting in the same spot in the future. Critter Ridder (available at TSC or garden supply stores), cat-urine soaked clumps of litter, fox urine, coyote urine, vinegar or ammonia-soaked rags, or home-made repellants such as ground pepper or garlic powder can be effective. A fence is the best way to protect a garden, it should be one to one and a half feet high to keep out rabbits. Rabbits do not like Magnolia flowers, planting some around your property, unwanted nesting sites, or throughout the garden can help keep them away from the area. When dealing with raccoons, it is very important to limit contact and wear protective gear at all times. Raccoons can transmit multiple diseases to people and pets, and can administer painful bites. Heavily sanitize anything that comes into contact with the raccoon afterwards. The Wildlife Conservation Center does not accept raccoons. 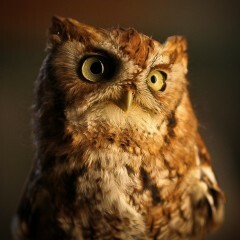 If you encounter one that you believe to be orphaned contact Division of Wildlife at 1.800.WILDLIFE. It is a juvenile raccoon that appears to be healthy but is out during the day. It is probably just learning how to hunt. Place the raccoon in an open, shallow box at least four feet up in the tree in which the nest was. If the tree has been cut down or if the nest was in an attic or chimney, place it in the closet tree where the raccoon was found. Leave the area in which the box was hung and leave the box there overnight. Do not feed the babies, as their cries will attract the mother raccoon. The mother raccoon will transport the babies to a new location. Trapping a raccoon is not recommended, as there are more safe and effective ways to handling raccoon situations. Any raccoon that is trapped must be euthanized or released on site, as it is illegal to relocate raccoons. Take caution that when trapping a raccoon, she could have a nest of babies that will then be abandoned. Once a mother raccoon is removed, the orphans are legally not allowed to be accepted into a rehabilitation center and must be euthanized. 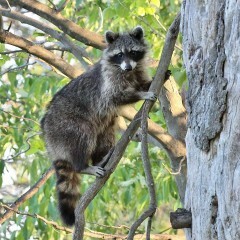 Raccoons frequent areas where there are resources available to them. Taking away these resources will deter the animal from coming back. Secure trash lids or coat the trash can with a small amount of cayenne pepper in water. This will prevent the raccoon from getting in the trash. Bring in any pet food that you normally leave out overnight. Move bird feeders away from any structures. Set these feeders up on metal poles to prevent them from climbing. Plastic structures can also be bought to put around the poles of feeders to prevent them from climbing. Use ammonia or Critter Ridder in these areas to deter them from coming near the feeders. Compost piles should be covered at night, or kept in a garage or shed. First determine if baby raccoons are present. Try to avoid evicting any raccoons while young are still in the nest. The mother will move them on her own when they are about 9 weeks of age. Set a radio near where the raccoon is entering (without blocking it) and play it constantly on a hard rock station for three days and three nights. It must be loud enough to be heard throughout the area. Try placing vinegar or ammonia-soaked rags, cat-urine soaked clumps of litter, or fox urine (available at hunting supply stores) in the area to discourage raccoons- quantity will depend on the size of the area. These may have to be refreshed several times a day. On the fourth day or when you know the raccoon to be gone, however it got in in the first place must be addressed to prevent it from happening again. Trim any branches or tree limbs that are close to the house or roof. This will help prevent raccoons from climbing onto your house and getting inside. Mix one quart of peroxide (3%) with ¼ cup baking soda and one teaspoon liquid soap. Bathe in this mixture then rinse with water. Repeat as necessary. 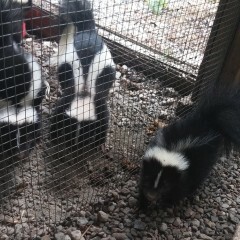 Caution: skunks can begin to spray as young as six weeks old! Keep the animal in a warm, quiet, dark location where it will be protected until you can bring it to a rehabilitation center. Young animals should be given a heat source, especially if kept overnight. NEVER attempt to give an animal food- inappropriate food or feedings can severely damage or kill wildlife. Set a radio near where the skunk is entering (without blocking it) and play it constantly on a hard rock station for three days and three nights. It must be loud enough to be heard throughout the area. Try placing vinegar or ammonia-soaked rags, cat-urine soaked clumps of litter, cat feces, or fox urine (available at hunting supply stores) under the shed/porch/deck to discourage skunks- quantity will depend on the size of the area. These may have to be refreshed several times a day. On the fourth day or when you know the skunk to be gone, however it got in in the first place must be addressed to prevent it from happening again. Screen off gaps underneath structures with heavy hardware cloth or fencing buried at least one foot beneath the ground with the lower six inches at a 90° outward angle so they cannot tunnel under it. The three types of venomous snakes in Ohio that will not be accepted into the center for rehabilitation are the Copperhead, Timber Rattlesnake, and the Massasauga Rattlesnake. It does not appear to be injured- simply seeing a snake on your property is normal and is no cause for alarm! Snakes are on their own from the time they are born, and will never truly be orphaned. The only time a snake will need to be brought into a rehabilitation center is if it has visible wounds. 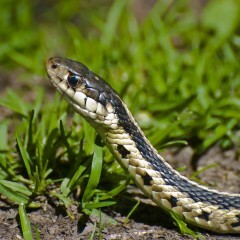 Snakes are great for the environment in that they control the rodent and insect population. Control the rodent and insect population in the area. This will take away the resources for the snakes. Remove piles of junk and debris, and keeping the grass cut short. Snakes find these areas to be perfect shelters and homes. Contrary to popular belief, parent birds will not reject a baby bird with human scent on it. Most birds have excellent vision and hearing but a poorly developed sense of smell. A baby bird without any feathers is out of the nest prematurely and needs your help. Try to locate the nest and return the bird if possible. Please keep cats indoors and dogs on a leash if you notice a fledgling in your yard. These young birds will be able to fly within a week. If you have found an infant baby squirrel lying on the ground, check it briefly for injuries and body temperature. If it appears to look healthy, is warm, and is close to a tree, the squirrel may be able to be reunited with its mother. Place the young squirrel in a small box. Hang this box as high up in the tree as you can reach by securing it with bungee cords or another form of support. If it is a cold day outside, fill a tightly sealed bottle of water or jar with warm water, and cover this with a thin cloth or a sock. Place this inside of the box with the baby squirrel. This will help to keep the baby warm until it is reunited with its mother. Leave the area and allow time for the mother to return. Observe the baby throughout the day for any changes in its condition, and to check to make sure the bottle is still warm. If the mother has not returned for the baby by dark, bring it inside and keep it in a warm, dark, and quiet place. Do not try and feed the baby anything, even if you have to keep it overnight, as incorrect feeding can be fatal. Call the center and bring it in for care as soon as possible. Sometimes juvenile squirrels will venture far from their nest and get lost. When they get hungry, they will climb onto anything moving, such as humans or dogs. Try to find the nest tree, leave the squirrel there, and leave the area. The parents will coax the baby back up the tree. Unfortunately, due to the high number of squirrels in any area, as soon as you live trap and relocate squirrels somewhere else, a new squirrel will quickly take its place in your residence, making this an ineffective solution. 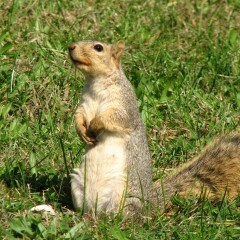 Remove or relocate foods that may be attracting squirrels to an area. This can include bird feeders, fruits, and vegetables. Taking away resources will make an animal go elsewhere in search of food. First determine if baby squirrels are present. Try to avoid evicting any squirrels while young are still in the nest. Set a radio near where the squirrel is entering (without blocking it) and play it constantly on a hard rock station for three days and three nights. It must be loud enough to be heard throughout the area. Try placing vinegar or ammonia-soaked rags, cat-urine soaked clumps of litter, or fox urine (available at hunting supply stores) in the area to discourage squirrels- quantity will depend on the size of the area. These may have to be refreshed several times a day. On the fourth day or when you know the squirrels to be gone, however they got in in the first place must be addressed to prevent it from happening again. Trim any branches or tree limbs that are close to the house or roof. This will prevent squirrels from jumping onto your house and getting inside. Open a window or a door, block off all other exits, and wait for the squirrel to leave on its own. Once it has left, determine how it might have entered and block it off. If you happen upon a turtle crossing the road, you may assist the turtle by placing it on the side of the road in the direction it was heading. 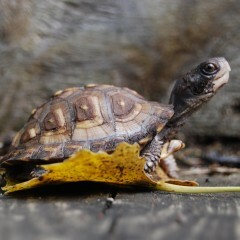 Young turtles are on their own from the moment they are born. Once they hatch they will locate the nearest body of water or suitable habitat. Please do not disturb them unless they appear injured. Even though they are small they will be fine! At certain times of the year turtles will travel across land to lay their eggs. Please do not disturb them! 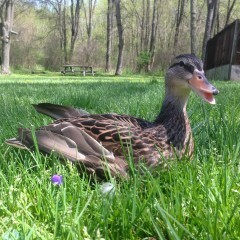 Please keep cats indoors and dogs on a leash if you notice a family of ducks or geese in your yard. 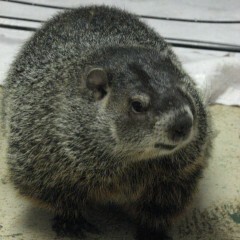 If you choose to capture one for treatment, remember to protect yourself from the woodchuck’s sharp teeth and claws. If you can find a burrow nearby that you believe the woodchucks may be living in, try placing or coercing the baby to go closer to the hole and hopefully reunite with Mom. If the mother does not return for the baby within a couple of hours, it is most likely orphaned. Set a radio near where the woodchuck is entering (without blocking it) and play it constantly on a hard rock station for three days and three nights. It must be loud enough to be heard throughout the area. Try placing vinegar or ammonia-soaked rags, cat-urine soaked clumps of litter, or fox urine (available at hunting supply stores) under the shed/porch/deck to discourage woodchucks- quantity will depend on the size of the area. These may have to be refreshed several times a day. On the fourth day or when you know the woodchuck to be gone, however it got in in the first place must be addressed to prevent it from happening again. Place an electric wire four to five inches off the ground a few inches around the perimeter of the fence. If you continue to experience problems with uninvited woodchucks, live-trapping is an option. Please see the Live Trapping section for trap rental information and important trapping and relocation regulations.